Have you ever tried authentic Japanese ramen? Do you like thick noodles or thin noodles? The straight or spiral ones? A pig-bone base or miso base? So many questions and often we don’t really know what we would like or what is good. The Japanese are, of course, known for their ramen, for the various types of noodles, broths and their special secret recipes. Basically, if you are a tourist or even if you live here in Japan and love ramen, you want to try ramen at every new place you go, to compare them to your personal favorite noodle dish and to see if it matches up. Not everyone has the opportunity to travel every city in search of every individual ramen shop. Even though that would be super exciting, there is an easier way to experience the different kinds of flavors of many cities – in one restaurant! This restaurant can be found in Hakata, Fukuoka city. Hakata Station (博多駅, Hakata Eki) lies in the heart of Fukuoka and offers a lot of shopping and cultural sights. The Canal City shopping center (キャナルシティ) is located west from the train station and is only a 10 minute by foot. The large mall offers a lot of shopping and dining. The top floor (5F) of the Cinema building is called Ramen Stadium (ラーメンスタジアム) and hosts eight different Ramen shops from all over Japan. During the beginning of the year, I lived in Fukuoka for a while and had a few opportunities to go and try the different kinds of ramen offered at the Ramen Stadium. One of the shops makes the famous Hakata Ramen with a distinct pork bone base flavor (Tonkotsu – 豚骨). I tried that ramen at the Ramen Stadium first since I like the Pork Bone base the best. I have tried many different variations of Tonkotsu Ramen and I have to say that the Hakata Ramen is very different from the usual Tonkotsu taste. I heard that many who are visiting from the Tokyo area don’t like it very much because of its unique taste. But I enjoyed trying a different flavor. If you love Tonkotsu Ramen I recommend this restaurant to you. It’s called Shodai Hide-chan (初代 秀ちゃん). You can also find other very famous ramen shops there, like Tontoro (豚とろ) from Kagoshima, which is also pork-broth based, different shops from Tokio, Sapporo, Sendai, Kumamoto, Kurume, Kyoto, Mojiko, Kanazawa and Toyama which all serve a big variety of broths, noodles and toppings. You can never be tired of their choices. The shops switch out regularly, so don’t worry, if your favorite one isn’t in the stadium now. It will come back! At my second visit I was also able to try a miso-based ramen from Sapporo. I am usually not a big fan of miso-based broths but this ramen was so delicious! Since everyone has different preferences when it comes to ramen, it is great to have a place where you can try new things every time you go and even make one of the shops your new favorite restaurant. Living in Kyushu, you can try authentic Sapporo ramen and come to love it. If you are only in Fukuoka for a short time, you can go around the different shops in the Ramen Stadium and order mini-bowls for about 200 yen and try more than one or two kinds of ramen during your stay. It’s a great way to get a little taste of the vast variety of Japan’s ramen. 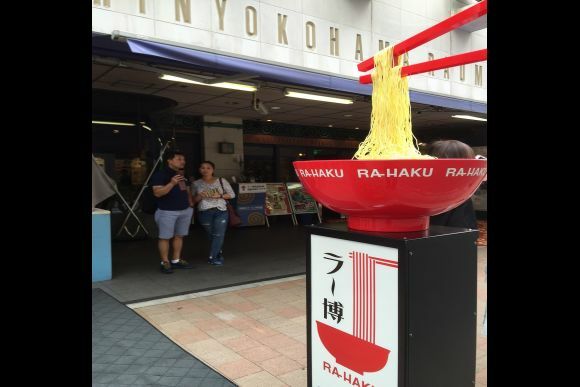 If you are in Fukuoka, the Ramen stadium is a must-see and must-try. It’s famous among the locals and tourists and known to be the best ramen stop in Fukuoka.